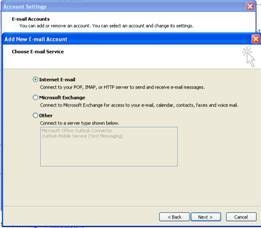 YOU ARE HERE: Home » Support Guides » Evolvit Support » Email » How do I setup a pop3 email account in Microsoft Outlook? 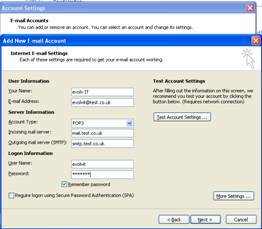 The following steps explain how to set up a Pop 3 account in Outlook 2007. Previous versions of Outlook will follow along the same lines as the instructions below but some wording may differ in the menus. 9. 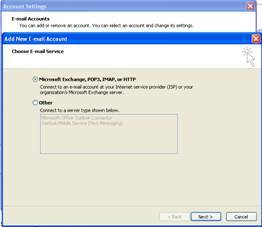 At the “Choose E-mail Service” page, select the radio button next to ”Microsoft Exchange, Pop3, IMAP or HTTP”. 13. At the “Choose E-mail Service” page, select the radio button next to “Internet E-mail”. 15. At the Internet E-mail Settings page, under “User information”, enter in your name in the box next to “Your Name” and also enter in your email address in the box next to “E-mail Address”. “Your Name” – this is the name that will be displayed on the email upon arrival in the recipient inbox E.G EvolvIT. Generally, this would be your name or company name. You will also need to select “pop3” in the drop-down box should this not already be displayed. 17. 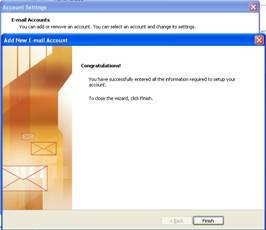 Under the “Logon information” heading, type in your email account’s username and password. 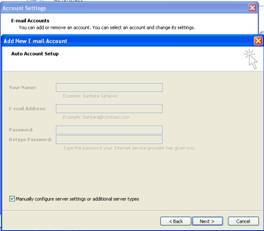 Ensure that the “remember password” is ticked to save having to re-enter your password each time you use Outlook Express. 18. Once all the boxes have been filled you can test that the details entered for your POP3 email account are correct via clicking the “Test Account Settings” button. Don’t struggle on with your IT issues. 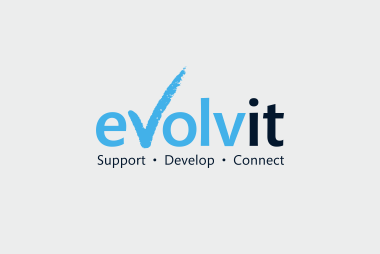 If you’re a business or individual with that needs Bristol IT support then get in touch with our specialist IT team. We’re happy to help solve your problems and get you back up and running.